I love, love, LOVE Spring! The warmer days, bouncy lambs, budding flowers and cherry blossom trees – what’s not to love? 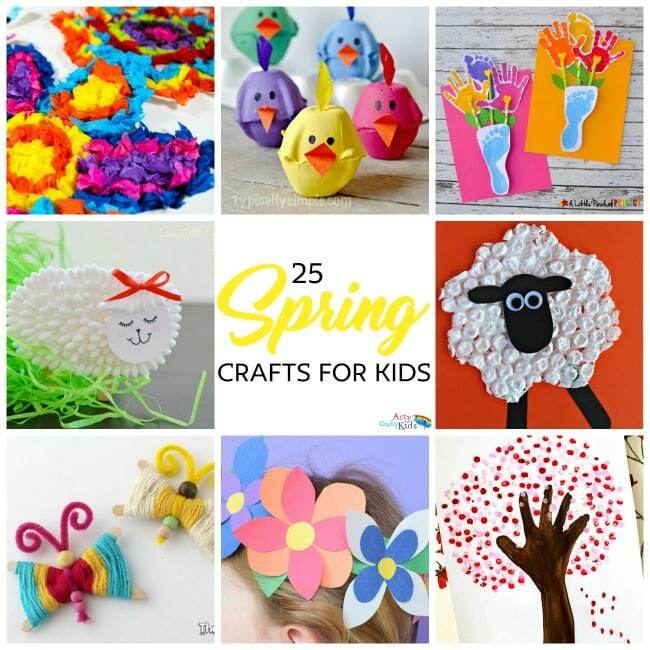 it’s a time of renewal and today I am delighted to be sharing 25 fun and easy Spring Crafts for Kids to get you set up with all your Spring themed arty crafty activities for the kids. 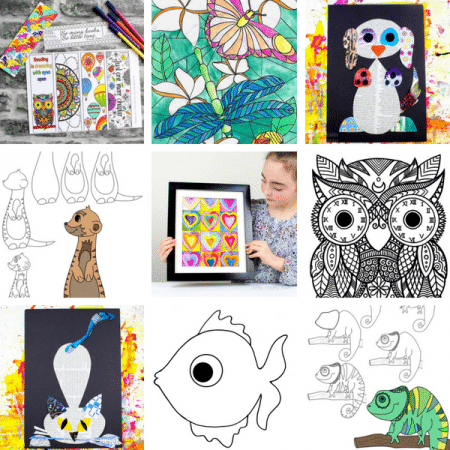 As always, expect variety and lots of colour! 1. I’m always amazed at the creative ways pipe cleaners can be used, and these pipe cleaner flowers are so so gorgeous! 2. Simple and sweet pebble ladybird. A great little addition to a plant pot or imaginative bug play. 3. Hyacinths are one of my favourite flowers and I just fell in love with this simple bottle top stamped hyacinth! 4. Spring wouldn’t be spring without the cherry tree blossom. 5. Spring is all about sunshine and showers, which means rainbows are plentiful this time of year; making this simple yet cheerful paper plate rainbow a must for Spring crafting. 6. These cardboard tube and tissue paper 3d flowers are lovely and surprisingly easy to make! 7. 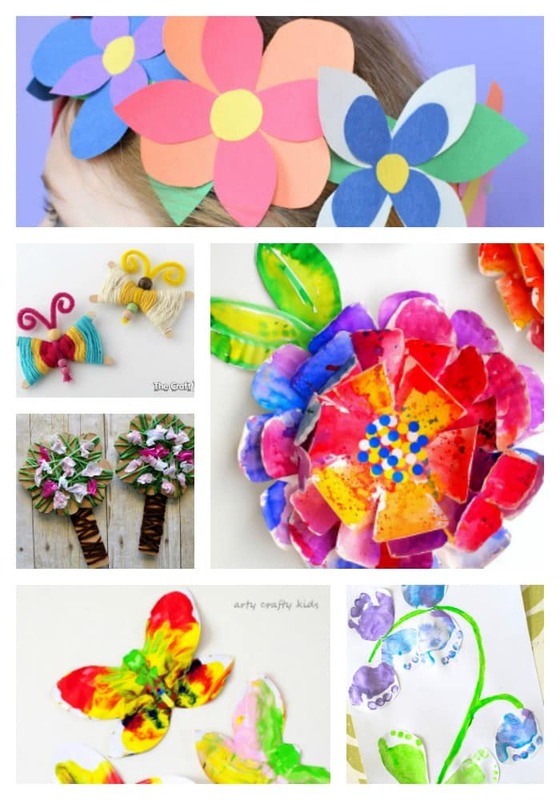 Kids will love the process of tearing, scrunching and sticking to make this stunning paper plate flower! 8. Start saving the egg cartons to make these sweet egg carton flowers – a great one for toddlers! 9. And once you’ve made the flowers, why not create these cute little egg carton chicks too! 10. We love our handprint trees and this cherry blossom handprint tree is a gorgeous addition to our collection of seasonal trees! 11. This is the sweetest little lamb I’ve ever seen, can you guess how it’s made? 12. 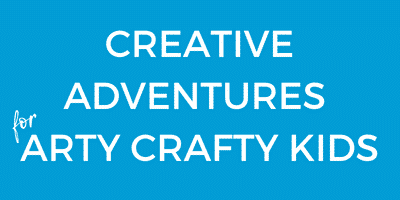 And come rain or shine, we have a craft for you! check out this adorable sunshine & rain cloud craft. 13. The kids will love the art technique used to make these doily butterflies. 14. Transform a cardboard tube to create a sweet bunny. 15. Use bubble wrap to make an adorable lamb. 16. You have to love the work of a preschooler and I for one think this paper plate butterfly is just perfect! 17. Create a darling hand and footprint bouquet. 18. These little tissue paper chicks are simply adorable! 19. Create a cherry blossom tree using fingerprints! 20. Feel the spirit of spring with an enchanting flower crown – this will be a great craft for inspiring play! 21. These yarn wrapped butterflies are so pretty! 22. Yarn wrapping is a great exercise for fine motor skills and this blossom tree is a craft and fine motor workout in one. 23. Watercolours are one of my all time favourite art materials and this layered paper plate flower totally sells them. 24. Use a classic art technique to make butterflies with your toddler and preschooler. 25. Use fooprints and tootsies to make a darling bluebell flower. 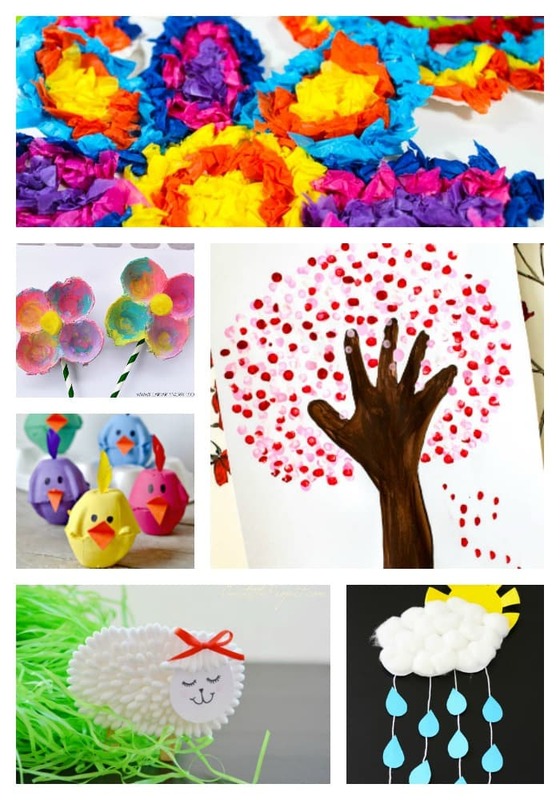 And that concludes our gorgeous collection of Spring themed crafts for kids! 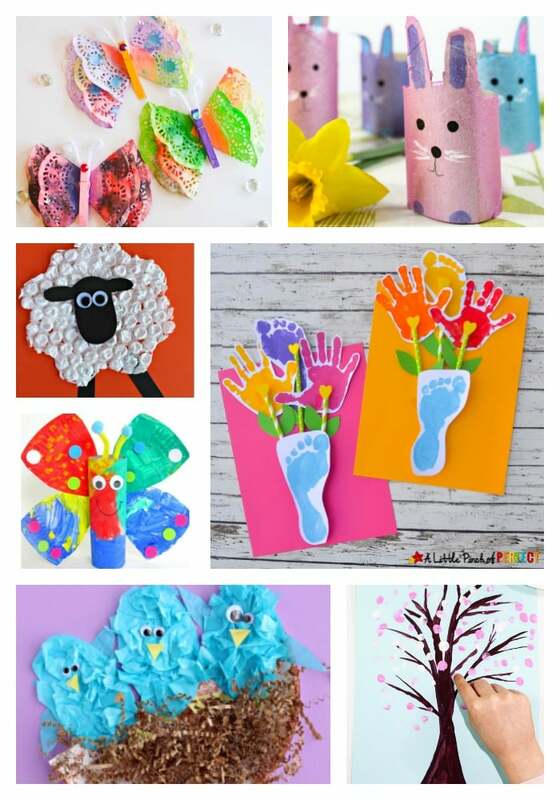 For Easter inspiration, take a look at our 9 Fun Easter Crafts for Kids and collection of adorable Bunny Crafts for Kids! 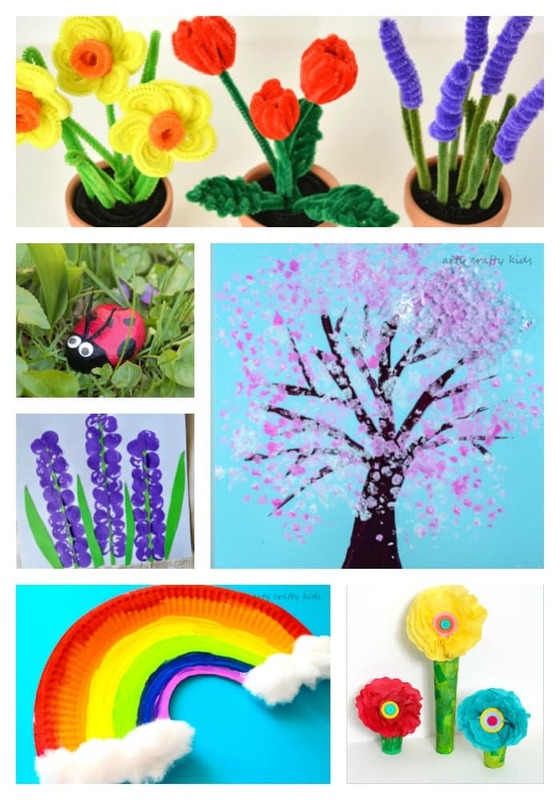 Pin 25 Spring Crafts for Kids for Later!